Until recently, tools didn’t exist that could simultaneously and individually analyze all of the different types of cells in an organ and their active genes, the segments of cellular DNA that encode functional molecules such as proteins. 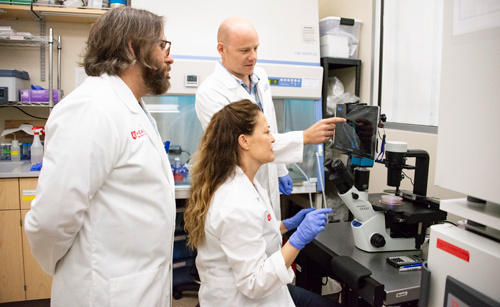 Working with the lab of Geoffrey Wahl, PhD, professor at the Salk Institute, and others, Spike and his team isolated breast cells from mice during different stages of breast tissue development. The researchers then used new genome sequencing technology to analyze which genes are turned on and off in more than 6,000 individual cells during normal development. This approach revealed a list of hundreds of potentially critical genes for further study as regulators of normal and cancerous development. These genes may provide targets for certain breast cancers that don’t have molecular targeted therapies. “This research promises new targets for these cancers, including genes involved in specialized cellular metabolism that are shared between early breast development and certain breast cancers,” said Spike. The data from the study gives new insights about the organizing principles of tissues and the molecular definitions of the cell types comprising them. The research shows that breast cells in early development that are not fully differentiated into mature cell types activate more genes, resulting in mixed profiles and expression of some genes in unexpected breast cell types.